GUEST BLOG: Priyanka Dalal – Movie Review: Sherlock Holmes! 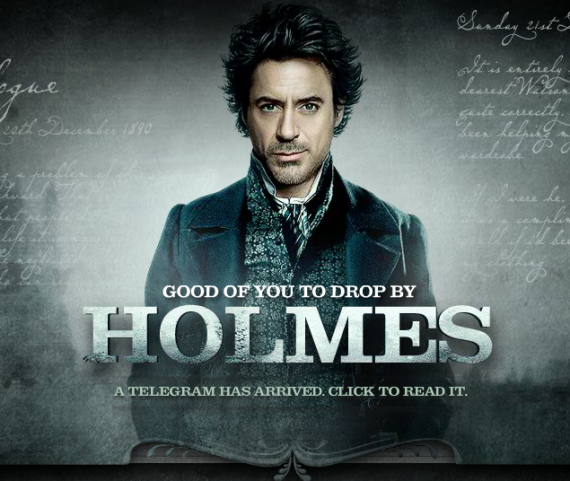 The first Guest Blogger on TalkingTails.in is Priyanka Dalal – and she is going to review Sherlock Holmes – The Movie. Priyanka Dalal is a social media enthusiast by profession based in Mumbai. She blogs her work insightat priyankawriting.com. She is also an avid reader of all sorts of books and a movie buff. In fact she has started a Fiction Book Club, do join if you are into reading! I have read a few Sherlock Holmes books, but I did not know what to expect from the movie. Both the actors Robert Downey Jr. (Iron Man fame) and Jude Law (Cold Mountain fame) are two that I think can do some real good work. They along with the old London setting full of carriages, hat wearers, women wearing those big skirt gowns and ongoing construction of the tower bridge have created a very vivid and engrossing movie. The banter between Holmes and Watson is well written. (BTW the quote ‘elementary, dear watson’ which has become a symbol for this duo is not to be heard in this movie. It was never part of the books either. It only became famous in the previous movies’) There are substantial parts played by Watson’s fiance Mary and the elusive love of Holmes, Irene Adler. What was however a little unexpected was the plot. From what I recall of the stories I have read, they tend to be lighter while this movie script is basically a dark drama of black magic and necromancy. The movie is about a Mr. Blackwood who is caught doing rituals that involve sacrifice where the victim is sent into a suicidal trance. He is apprehended by Holmes and jailed. Since then his dark powers only grow and he claims that he will resurrect after 3 days of his hanging and then conquer the world (of course only after driving Holmes insane). Soon, Watson declares Blackwood dead after being hanged, but after 3 days the gravestone is broken and Blackwood is seen rising from his grave. This is also when Irene Adler contacts Holmes and commissions him to find a missing person. Irene was herself working under another mysterious but dangerous guy who was also after Blackwood but for different reasons. As the saga goes on making us think that Blackwood is invincible, I was busy thinking that this is not like Sherlock Holmes stories at all, it is all too scary. I was however proved wrong as at the end, the story takes a complete shift and we have Sherlock Holmes having solved the case and explaining his actions… thats when I remember this trait of the books, where the reader is left only guessing and bewildered Until and only Until the great Sherlock Holmes chooses to explain his reasoning! This movie was nominated for Critics Choice Award category at the Broadcast Film Critics Association Awards. It WON the Best Performance by an Actor in a Motion Picture – Musical or Comedy for Robert Downey Jr.
Have you seen this movie? What are your reviews/reactions? The phrase ‘elementary, dear watson’ never appeared in any of Holmes stories. Holmes often said “elementary’ or ‘dear’ or ‘dear Watson’, but never the whole phrase together. (This is a popular quiz question). I have not seen any Holmes movies other than this, so cannot comment on movies. But my guess is, this phrase is made famous by probably some movie. Next Next post: Social Media Marketing: Future or HOAX?